As spring creeps closer and closer with the days getting longer, and the weather getting increasingly more inviting, pedicab season will be here before we know it(if not arrived already). Now is the time to go through your fleet and get things tuned-up and dialed-in for the upcoming season. As cliché as this might sound, as a business owner/operator we all know how true this can be. Flat tires and broken chains are not only a hassle but for every minute your pedicab is out of commission, you are not making money. Ultimately things break and often we have no control over how or why, but there are some things we can do that will help mitigate this down time keeping you on the streets longer and in the long run, keep your repair costs down. Remove your crank and inspect your bottom bracket. Is it free spinning and smooth or does it feel course and gritty? If your answer is the latter than it is time for replacing. Bottom brackets carry the load of the drive train, when they are worn out you need to exert twice the amount of energy to go half as far. This seems like an obvious one, but you would be surprised how these can be neglected. Inspect both front and rear brake pads, are they worn down, cracked, missing? Be sure to inspect and test your hydraulic brakes as they often need to have reservoirs topped or bled. Don’t forget this directly effects the safety of you, your passengers and the people around you. No matter how hard-core you are, dirt and grime are not your friend. One place that is out of sight but not out of mind that can be a magnet for grime build-up which in-turn directly affects how your pedicab runs are your cables and housing. These are components that should be replaced every season. If you are replacing one it is good practice to replace the other as the are two components that interact very intimately with each other. Often times shifting troubles (skipping or jumping gears) can be traced back to cables and housing. Perhaps one of the most important and equally over looked components on a pedicab. Chains should be replaced AT LEAST every year. 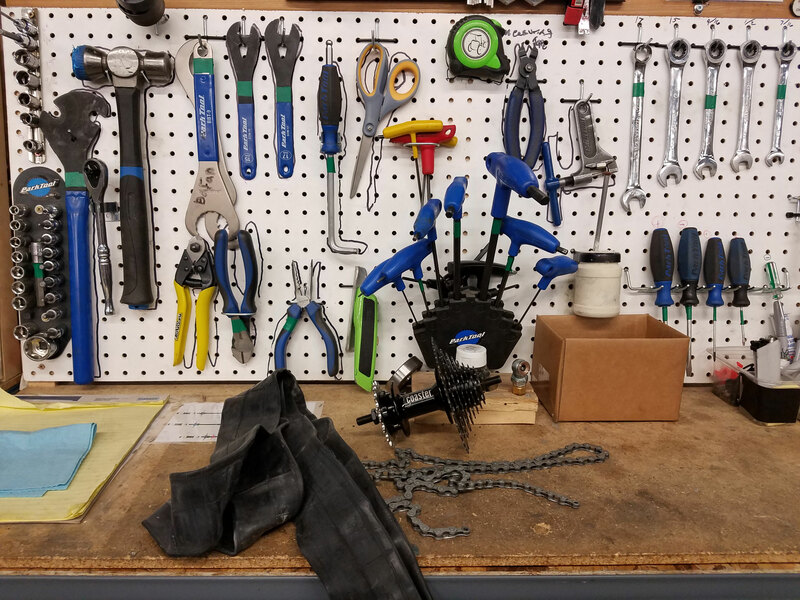 If you are running your pedicab hard day in and day out you should consider replacing your chains several times over the course of a season. This may seem excessive but as chains stretch they begin wearing down the teeth on chain-rings, cogs, cassettes and hubs. When you weigh the cost of replacing a chain vs. replacing an entire drive-train this becomes a no brainer. Additionally, a broken chain is not a repair you want to be dealing with on the side of busy road with customers on board. Inspect wear on your COGS, chain-rings and cassettes. Hopefully you have been changing out your chains on a regular basis (see above). Even a well taken care of pedicab will eventually show wear on these components. Worn down teeth will lead to chains skipping and jumping again, not something a driver wants to deal with in the middle of a ride. How do the components in your drive-train work as a team? Are things spinning smooth and quiet or do things feel clunky and noisy. Cables and housing, chain, cogs, chain-rings and cassettes will all ultimately dictate how well things are spinning and shifting. Park Tools has many useful resources for tuning your pedicab, check out their article on Rear Derailleur Adjustment. It is good practice to go through your lights and wire harnesses at the beginning of the season. Are all your lights, turn signals and brake lights functioning properly? Inspect wire harnesses for rips and tears. Take a minute to inspect your light brackets to be sure that your lights are secure and in good shape. There are some city ordinances that require functioning operating lights, so this can be an important one. This is one of those that when you find yourself on the side of the road fixing a flat you are going to be kicking yourself for not paying attention to now. Replace your tubes and tires at the beginning of every season is a good habit to get into. While there may not be any obvious signs of damage, roads can be brutal, off season weather can be to. With a fresh set of rubber, you know you are going to get the season off to a good start. Finally, it is a good idea to go through your wheels and inspect for any broken spokes. It is not uncommon for broken spokes to go unnoticed. Wheel with broken spokes can cause big and potentially hazardous headaches if left unaddressed. A broken spoke will cause a shift in tension causing more spokes to break resulting in a wheel that goes out of true and in a worst-case scenario could break the rim. Like most things on a bike, the smallest thing can often have the biggest consequences. In the end you are going to get out of your Pedicab what you put into it. Most of us do not have operations with dedicated road-side pedicab service. This’s why it is so important to be sure you have your pedicab in the best shape possible the moment its hit the road. Be sure to visit our parts store for these parts and many others for your Coaster Pedicab. If you can’t find what you are looking for please feel free to contact us at any time. Plan on getting more chains.